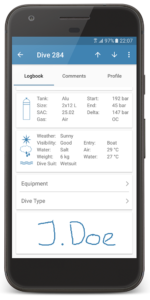 You can now link equipment to dives and select the type of the dive. 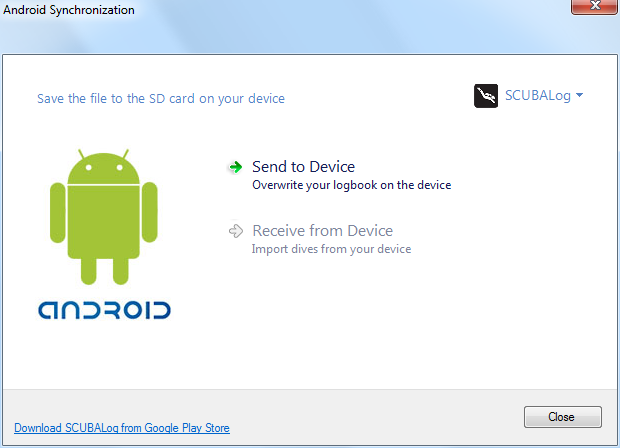 If you’ve previously added this data in the desktop or iOS version, it will automatically show up in the Android app. 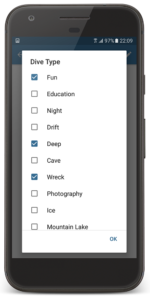 You can also edit the dive types list (add, rename and change the order of dive types). 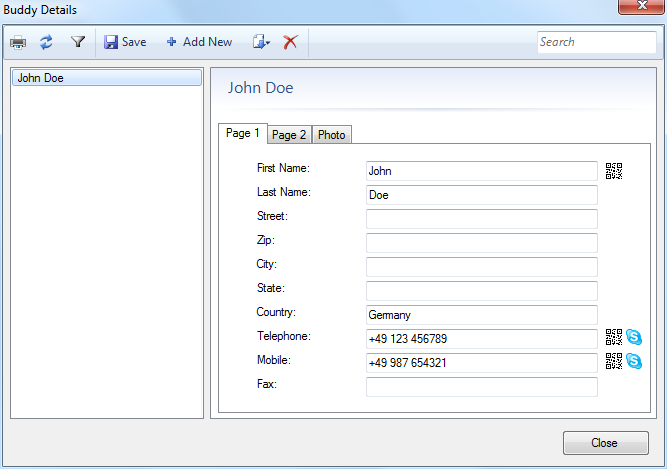 The buddy signature supports now also “dots”. 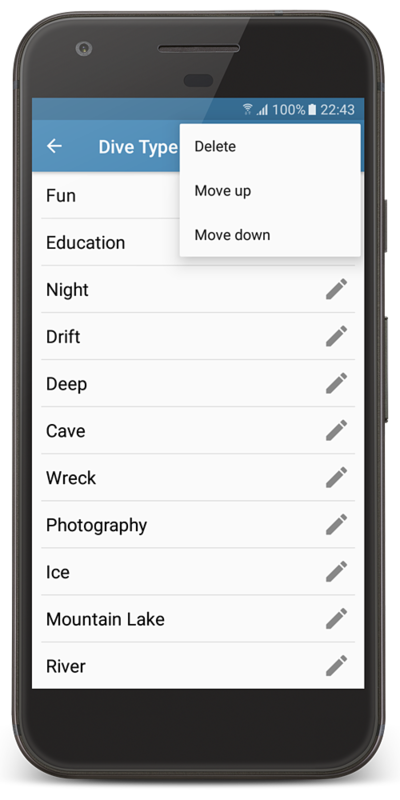 The new version is using the new Android 6 runtime permissions, which means you don’t have to allow all permissions when installing the app. 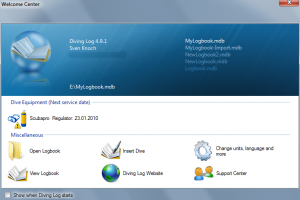 Instead, Diving Log will ask for specific permissions (e.g. 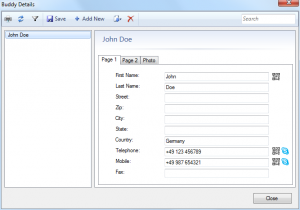 GPS) if you want to use a function that needs that permission. 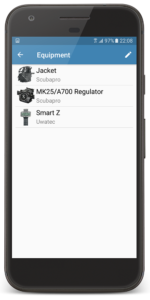 Android SCUBALog export: I’m trying to provide some more options and choice for Android users by cooperating with other app developers and I’m glad that the first one is now available. 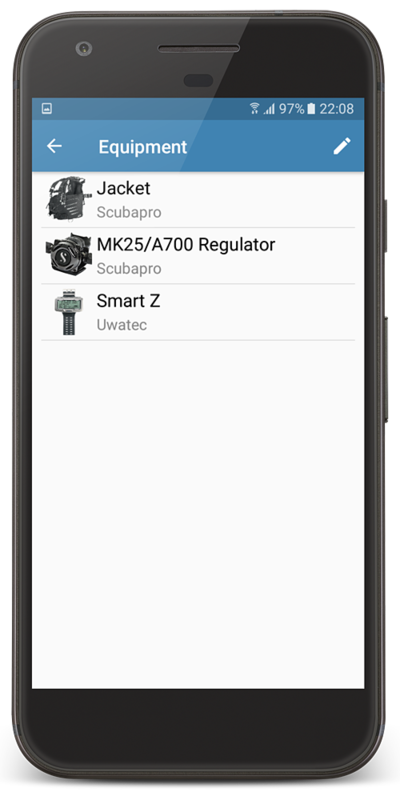 You can export your data to the Android app “SCUBALog” (import is planned in the future). You’ll find an app switcher in the Android sync dialog where you can change the data format. 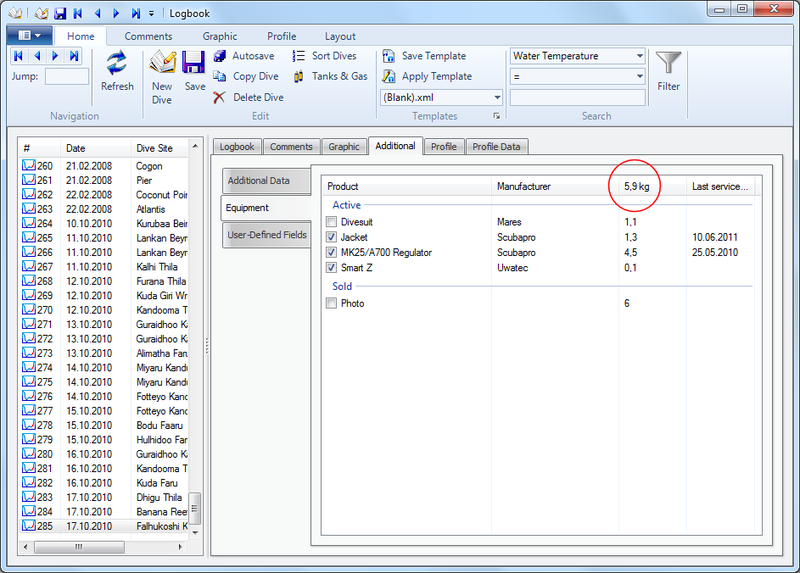 Equipment weight calculation: You could enter the weight of each equipment item for some time in Diving Log, but up to now nothing was done with this information. 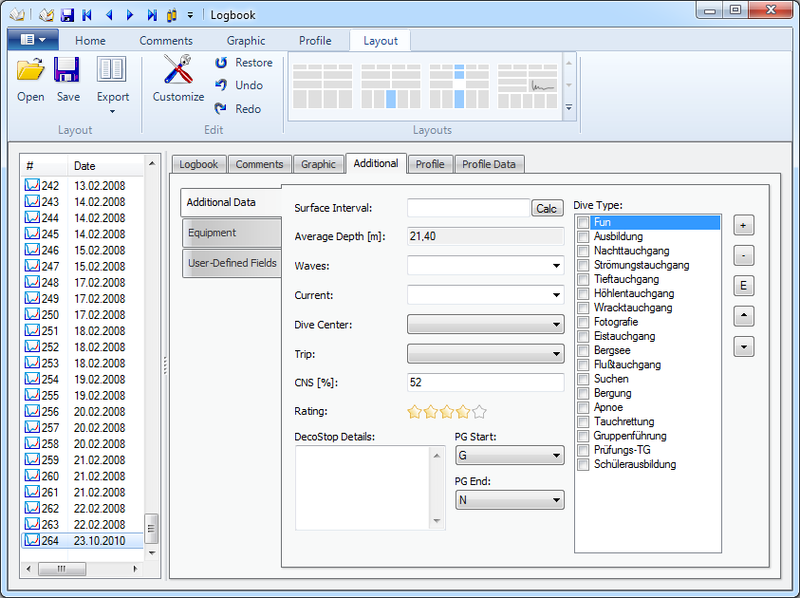 But now you can select any number of items in the list and the overall weight is calculated at the bottom. This is useful when preparing for a vacation, for example. Additionally you can see the weight of all checked equipment items in the logbook per dive. 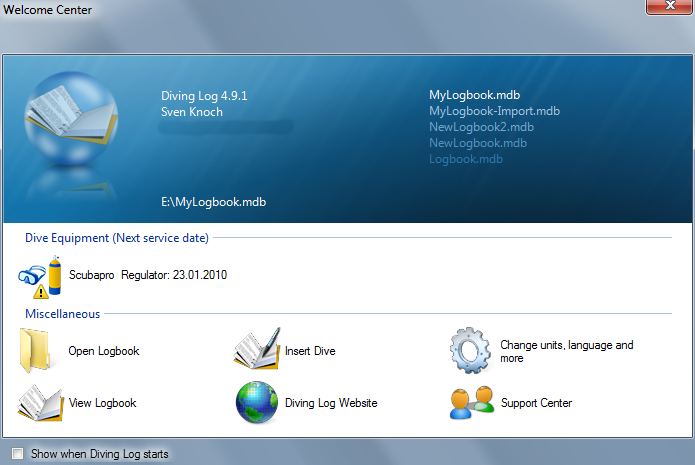 Skype integration: I’m sure many of you use Skype and now you can call a phone number right from your logbook by clicking the little Skype icon behind a number in the buddy and shop dialog. This works with the Skype desktop app, but also with the new Skype app for Windows 8. Make sure to enter the country code for each number if you want to use this feature, otherwise Skype seems to have problems. If you want to use your mobile phone, you can scan the QR code to quickly call that number. 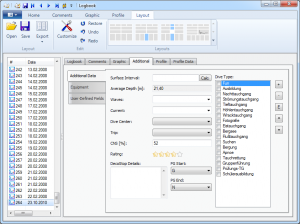 In the latest update I’ve finally included the Template Manager. 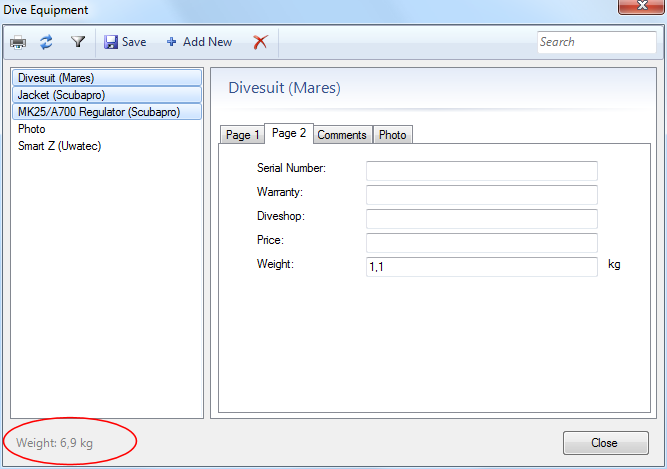 It enables you to quickly update several dives at once, even though this is now also possible using the new table editor. 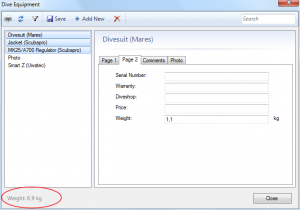 If you are not familiar with the template function, I recommend you watch this video tutorial from the support website. 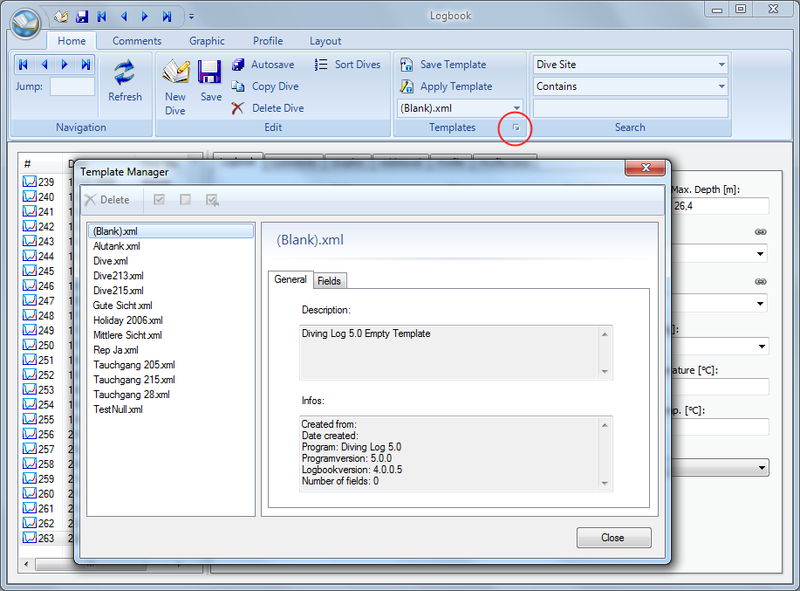 To access the template manager, you can click in the “Logbook” menu the “Template Manager” item, or in the logbook window, the small dialog launcher button in the Ribbon. 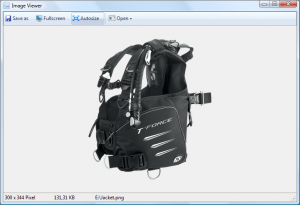 In this update I’ve fixed also a bug which could crash the application on Windows XP, when interacting with the dive profile. 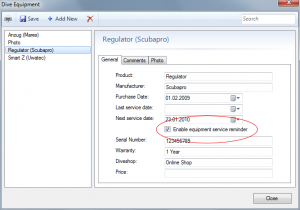 The equipment service reminder is now also included. 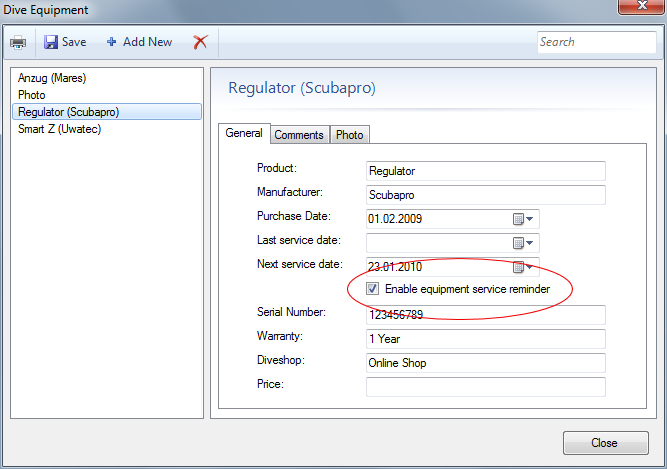 To activate it, check the box in the equipment dialog. 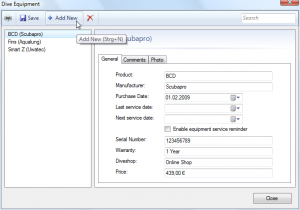 As soon as the revision date for one or more items is within the time span you have set, the Welcome Center will pop up during startup and the equipment items were displayed. 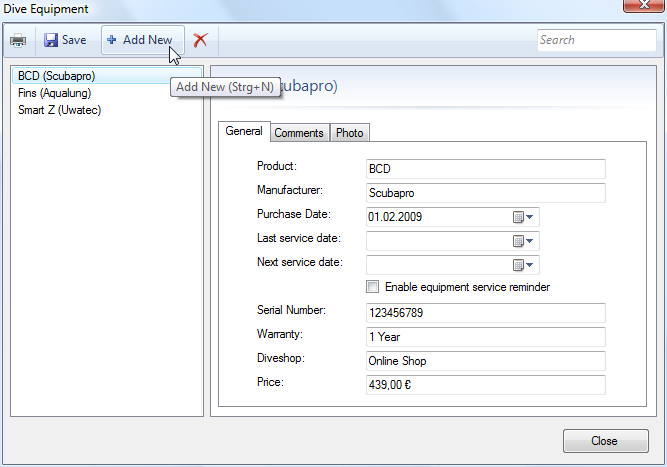 When you click an item it will be shown in the equipment dialog. 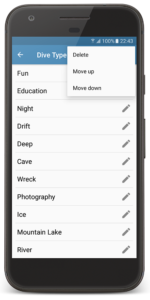 Keyboard shortcuts enable adding and editing data without ever touching the mouse. 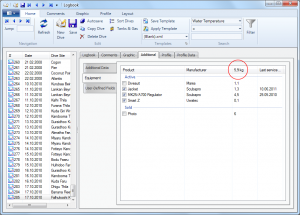 Simply press Ctrl-N for adding a new item, the cursor jumps automatically into the first field. When you’ve entered the data press Ctrl-S to save the data. With the Del key you can delete one or more items. 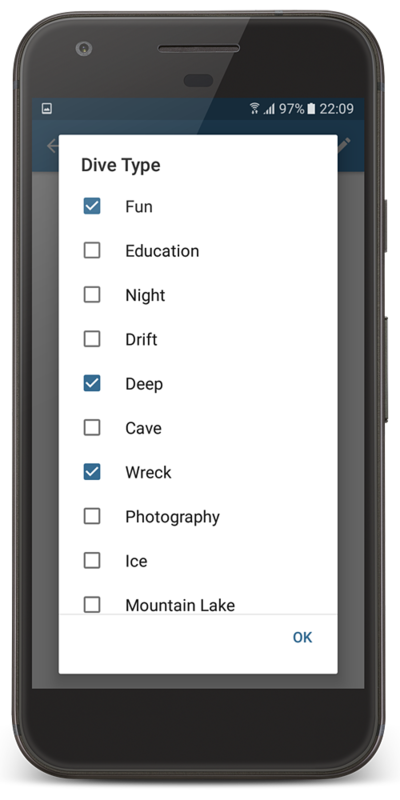 The new instant search field in the upper right corner (Ctrl-F put the cursor into the box) lets you filter the displayed data in the list, which is useful for long lists like dive sites. 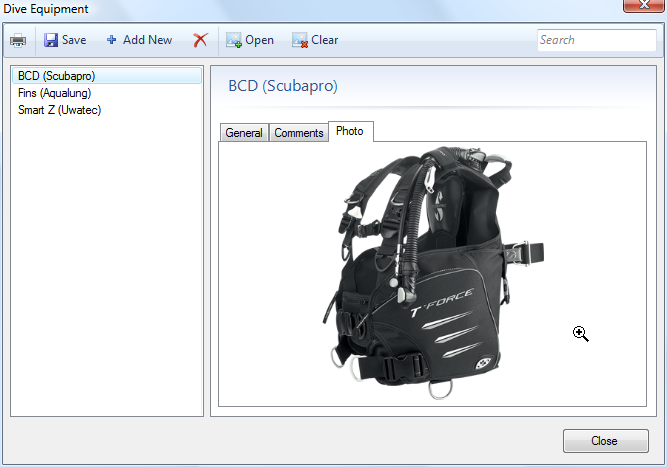 In order to view images like the equipment photo or the dive site map properly I’ve added a new built-in lightweight image viewer. You can view any image just by clicking it with the mouse when you see the magnifier cursor. The Image Viewer can be used across the whole application, e.g. 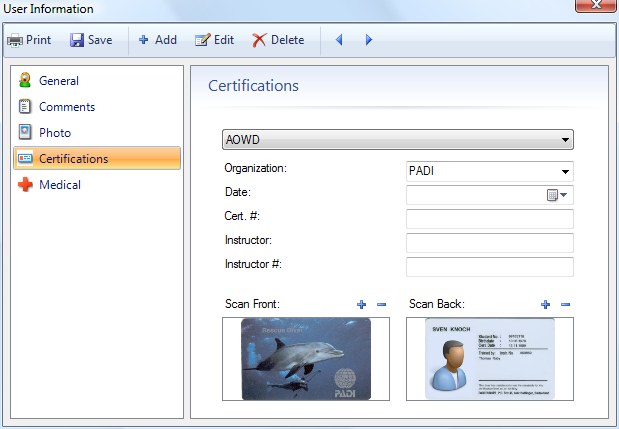 by clicking the certification images, in the logbook table or from the logbook photo section. Currently it has only some basic features, but I want to add more features in future like a thumbnail view, printing and a slideshow.